John Deere continues to expand its Worksite ProTM attachments lineup with the addition of the SS30 model Stump Shredder. Ideal for landscaping and construction job sites, the new shredder removes stumps from 203 mm (8 inches) to 711 mm (28 inches) in one pass. Larger stumps are easily removed with multiple bores. 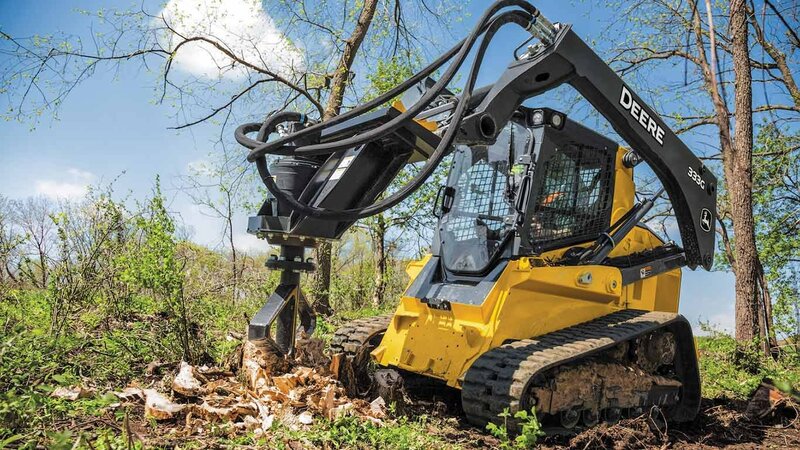 The stump shredder is optimized for the new mid- and large-frame G-Series skid steers (320G, 324G, 330G and 332G) and mid- and large-frame G-Series compact track loaders (325G, 331G and 333G). For superior ease of operation, the shredder's hardened pilot cone draws the auger into the stump while 19 mm (0.75 inch) thick, AR500 steel blades efficiently cut the stump. With the SS30 model, operators can bore up to 508 mm (20 inches) into the ground to remove stump feeder roots.